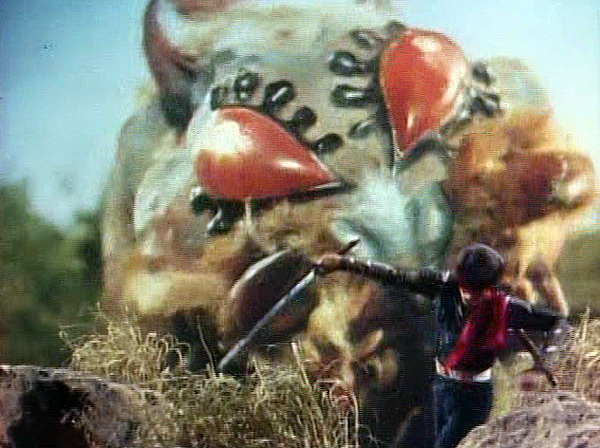 Seems Japan has been beset by giant monsters forever, and luckily for us today heroes like Ultraman are around to fend them off. 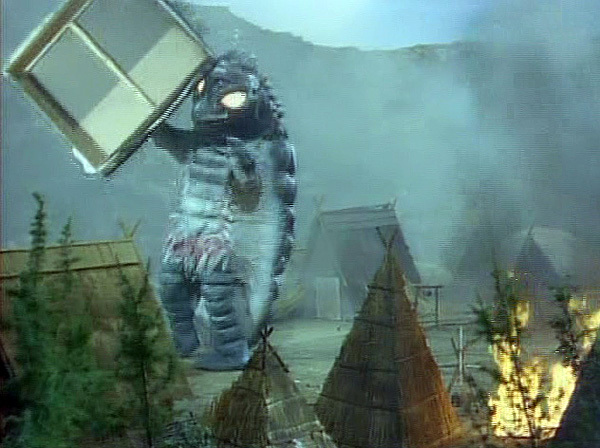 But in the fuedal era, centuries before any space-faring monster fighters, laser-weilding science patrols or little kids with watches that summoned giant robots were around, it was up to a select few NINJA to do these monsters in. 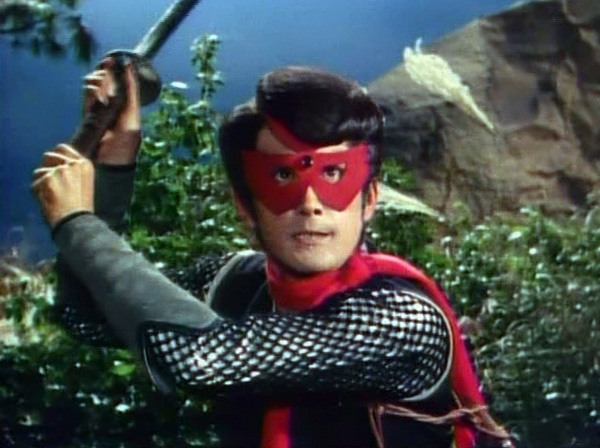 Enter multi-media shinobi superhero Red Shadow, the coifed creature killer of Kamen no Ninja Akakage. 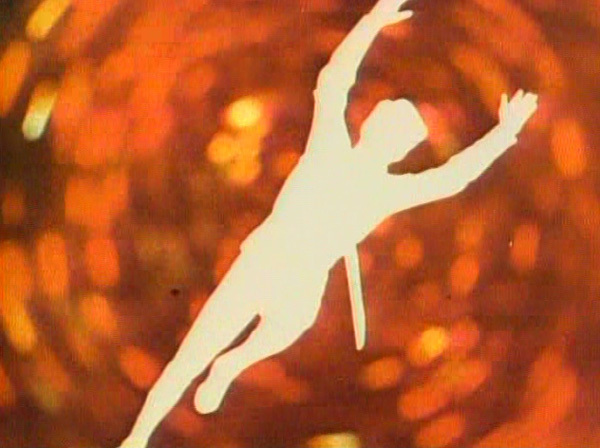 This government-charged agent of justice (played by Sakaguchi Yûzaburô) could fly, shoot eye beams, summon a magic twister, and all sorts of other jazz. 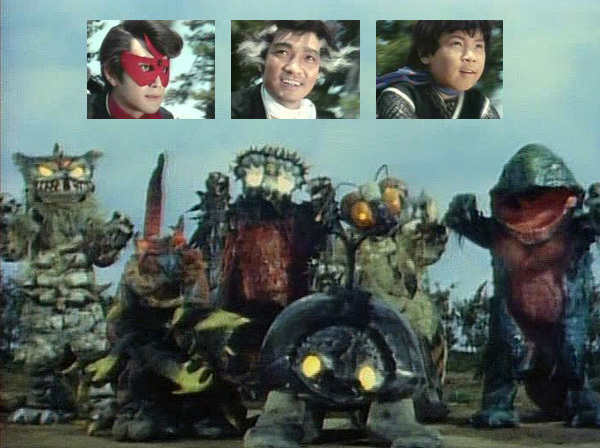 He and partners Aokakge (Blue Shadow, the requisite snot-nosed-brat, played by Yoshinobu Kaneko) and the veteran Shirokage (White Shadow, another one of Maki Fuyukichi‘s several ninja franchise roles) also loved throwing really potent hand grenades at monsters until everything in sight exploded. 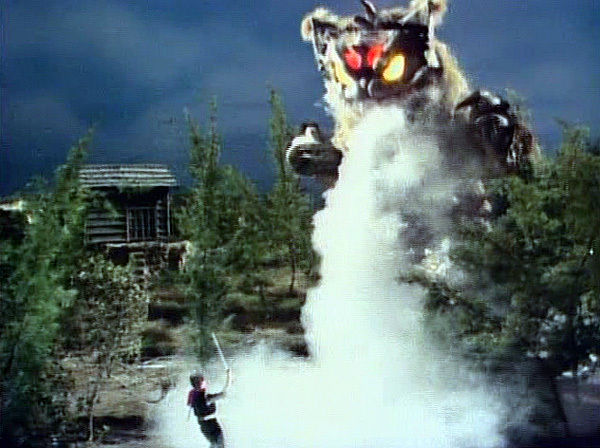 Know what I love most about this shot of the main baddie of the series? 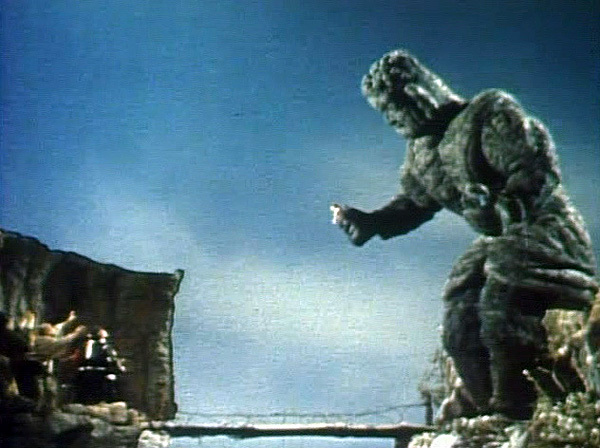 It allows me to use a term like "Harryhausen-esque!" These optical printer composites were still pretty new territory, especially in color and on a television budget. Sometimes they're rather good, other times not so much, but they are never a deal breaker. Good use of rear projection. The color exposure differences sometimes hinder these shots, but again, the color format was new. 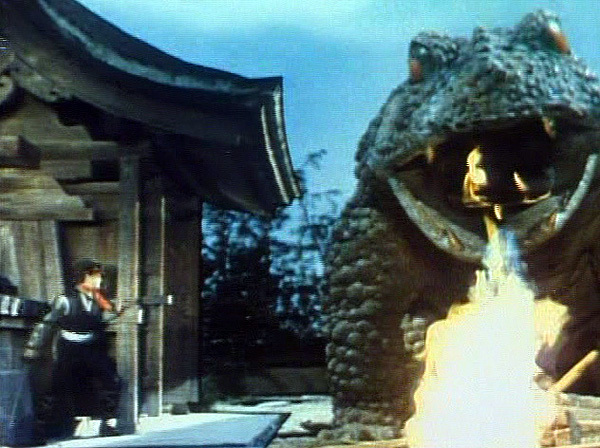 Miniature figures and modestly-budgeted modelscapes were often complemented by fire or smoke spitting critters that lent increased dynamics to otherwise cheesy-looking scenes. 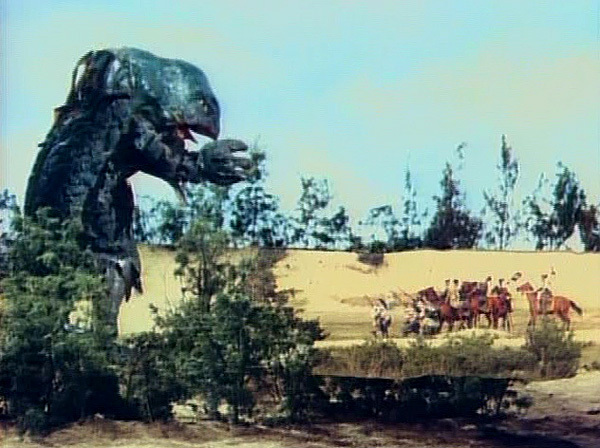 This familiar giant toad is probably the very suit from MAGIC SERPENT, or at least poured from the same foam rubber molds - note the indent on the nose where in the previous movie the glowing horn would have been. TOMORROW – a whole pile of sponge-suit monsters! It was a big surprise for me to know this TV show was aired in America. after reading this post i succeeded in downloading this movie from youtube and when i was watching it i nearly remembered all the feelings i had when i was watching the movie as a kid!!! but i still love it…i dunno if im crazy or this movie truly had some amazing aspects? !..specially when it was only supposed to be for the kids..